August 11 - 12, 2018 – By popular demand, Terral Hill is back for another Icelandic groundwork/riding clinic! 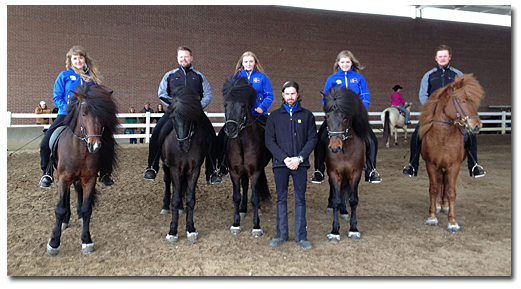 We are excited to host another clinic for the Saint Skutla Icelandic Horse Club with Terral Hill of Taktur Icelandics. Everyone had such a great time last year it was an easy decision to have him back again! 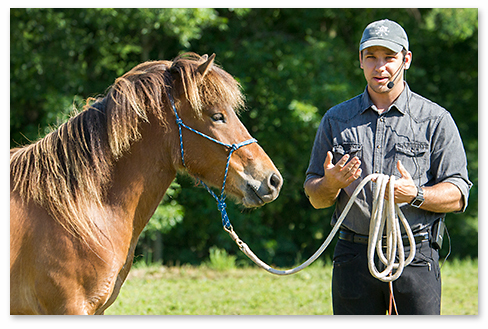 In this clinic Terral will once again focus on blending his vast natural horsemanship experience with traditional Icelandic methods to create a willing and responsive horse. This year participants can choose to either work on groundwork or on riding. All levels of horses and riders are welcome. Plus, there is also the opportunity to come audit to see what it's all about. To view photos from last year's event check out Andrea's photo album. For more information on the clinic including registration materials, please contact us. But hurry - spots are filling fast! We were happy to host the Saint Skutla Icelandic Horse Club's fall clinic with famous Icelandic rider and trainer, Guðmar Þór Pétursson. Not only were we blessed with a great clinician, but wonderful warm fall weather too! It was a great event and we hope Guðmar will return to continue the group's instruction in the future. 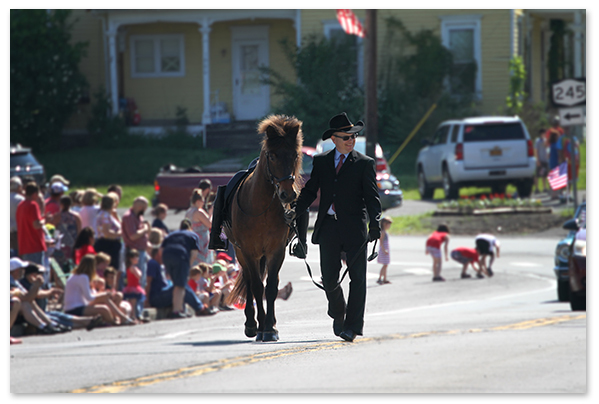 When we heard that the town of Gorham, NY needed a rock solid dark colored horse to be the ceremonial riderless horse in their Memorial Day Parade we knew we had just the horse for the job - Hergill frá Oddhóli. Having performed in many large competitions and previously lived in busy Los Angeles, California, nothing much phases Hergill. We knew we could depend on him - and our trust was well placed. Hergill and Steve lead the parade and did an excellent job. We were so proud to be able to participate in this wonderful tribute to our fallen soliders. 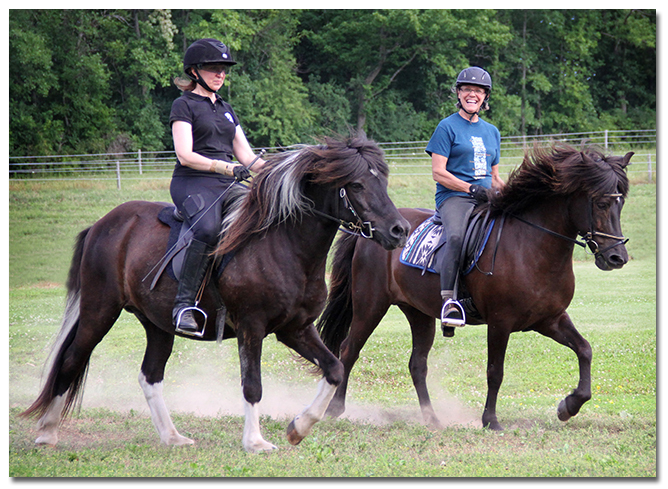 July, 2014 – Icelandic Pleasure Rider Clinic with FEIF Breeding Judge and Certified FEIF International Trainer Barbara Frische held at Sand Meadow Farm! Completely geared toward the pleasure/trail rider, Barbara has given this clinic for several years in Europe and it has proved very popular. At Sand Meadow we had a full clinic with 10+ riders and many auditors - all of whom really enjoyed the experience. 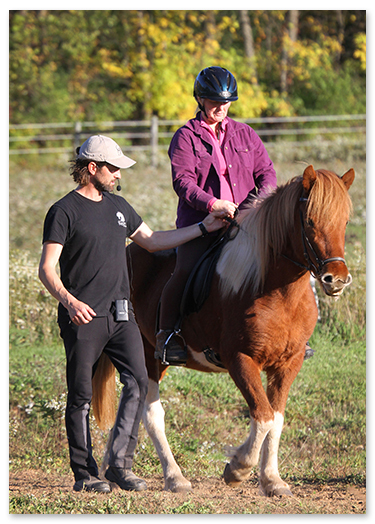 We had riders and horses of all levels and abilities and Barbara was flexible enough to adapt to all. Of particular popularity was the drill team riding! Outside of the formal clinic Barbara also gave private lessons and did a mini clinic on the day following the clinic on judging Icelandic horse conformation. All and all a great event and one we hope to do again soon! April, 2013 – Hergill performs with the Knights of Iceland at the Equine Affaire! Our own first prize Hergill frá Oddhóli performed with Gudmar Petursson’s Knights of Iceland demonstration team at the Equine Affaire at the Ohio Expo Center in Columbus, Ohio. If you haven’t already seen them, the Knights put on a fantastic show with some of the top representatives of the breed in the country. We are proud that Hergill was selected as part of the elite team for the Ohio event.